You are here: Home / Den Talk / Amateur football is the biggest winner at Orange Helmet Awards. Amateur football is the biggest winner at Orange Helmet Awards. 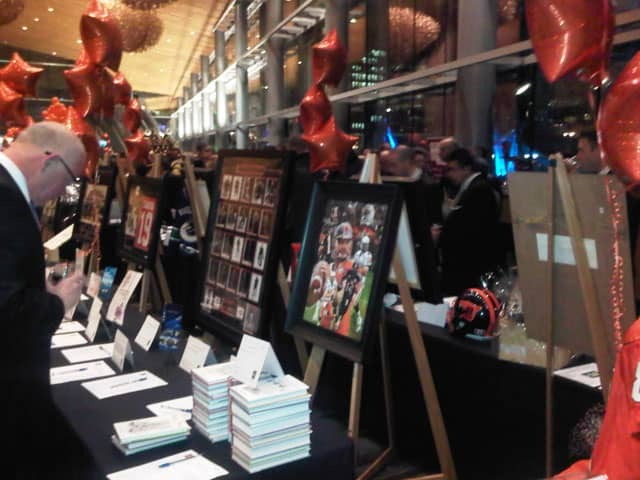 The 8th annual BC Lions Orange Helmet Awards took place on Friday March 4th at the Vancouver Convention centre and once again the event was a huge success for amateur football in BC. The awards were the brainchild of the late Bob Ackles who wanted to create a way to assist and grow grassroots football in British Columbia. Prior to last nights event, the program had raised more than $420,000 over its seven year history. I was lucky enough to this year’s event at the invite of Kristina Sinclair of the Rosedale on Robson. The first thing you notice is that this event brings out some of the big names in Vancouver. Leaders of the business community, current/former players and even politicians attend this semi-formal affair and many of them bring their pocket books. Additional funds are raised through the impressive silent and live auctions, which feature a large variety of sports memorabilia and other unique items. Following the reception that starts the evening, a tasty three course dinner was served which this consisted of butter lettuce salad with candied pecans, followed by a delicious merlot braised beef dinner with mashed potatoes and winter vegetables. The meal was topped off by an Okanagan apple tart and caramel sauce for dessert. The Orange Helmet awards are presented during the festivities and of course this year’s event featured an impressive lineup of speakers. 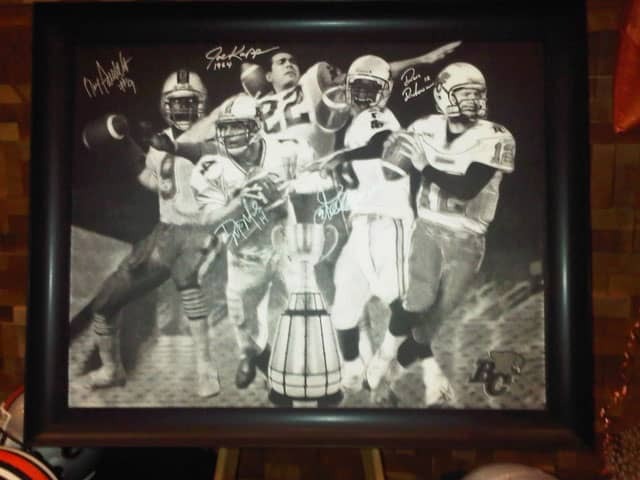 The quarterbacks who led the Lions in each of their five Grey Cup championships; Joe Kapp, Roy Dewalt, Danny McManus, Damon Allen and Dave Dickenson, were all on hand to share their stories and memories from their stints as BC Lions. All and all it was a great night and a great experience for this BC Lions fan. Bob Ackles would be proud of the success of the event and how much money has been raised for amateur football in BC. A thriving amateur football system can only help the CFL down the road, and the Lions are certainly doing their part to develop football in the province of BC. For a full list of this years Orange Helmet Award recipients, check out BCLions.com. The also have some video footage of the event.